The Mega's economy thread/profile forming machine which equipped with swivelable roller shafts. This ensures optimum capacity and use in making threads and axially parallel profiles in the through-feed process. However, short cylindrical parts (especially thread pins) can also be rolled in the through-feed process automatic feed of the work is necessary. This machine can also be used in the in-feed process with parallel die axes, the length of the profile to be rolled depends on the width of the rolling dies, there is no axial movement of the workpiece. Swivelable roller shafts at full utilization of the rolling force. Short working cycles by increasing the forward-return speed. Increase driving power, optional use in slow motion/normal and rapid advance by hydraulic multi-circuit system. Increase driving power, optional use in slow motion/normal and rapid advance by hydraulic multi-circuit system. Increase in the efficiency and improvement of the utilization to power by gears on parallel axes and drive by universal shafts. 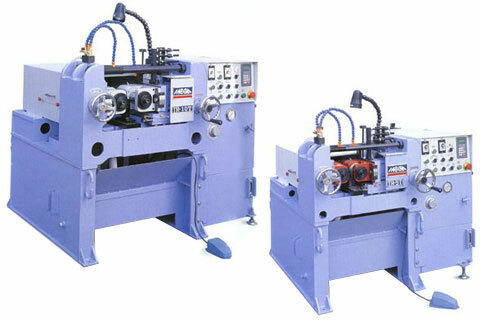 Free passage between the roller shafts for the manufacture of any length of profiles.